Acquired posteroinferior capsular contracture, generally in the throwing athlete, initiates a pathologic cascade, which can lead to high shear stresses on the posterosuperior labrum and biceps tendon insertion occuring during the late-cocking phase of throwing which can lead to SLAP lesions/ dead arm syndrome. Increased ER of the shoulder may cause RTC abrasion/tearing against the posterosuperior glenoid. Repetitive twisting of the rotator cuff fibers may lead to torsional overload and shear failure of the cuff fibers generally on the articular side. (Burkhart SS, Arthroscopy 2003;19:404). Rotator cuff tendinosis in the overhead athlete is generally not related to impingement and is an overuse injury. Rest and supervised rehab is generally successful treatment. 5 phases of throwing: wind-up, cocking, acceleration, deceleration, follow-through. Throwing athlete injuries are often associated with Scapular Dyskinesis. Phases of Throwing: Wind-up, early cocking, late cocking, acceleration, deceleration, follow through. Bennett Lesion: mineralization of the posterioinferior glenoid believed to occur in response to traction of the capsule from repetitive stress of throwing. Cinicial significance is unknown. Occurs in 22% of professional pitchers (Wright RW, AJSM 2004;32:121). Rotator Cuff Tear: usually partial-thickness articular sided supraspinatus tears. “Valgus extension overload syndrome” = High valgus loads with rapid elbow extension produce tensile stress along the UCL, flexor-pronator mass, medial epicondyle apophysis, and ulnar nerve as well as shear stress in the posterior compartment (posteromedial tip of the olecranon and trochlea/olecranon fossa), and compression stress is produced laterally (radial head and capitellum). 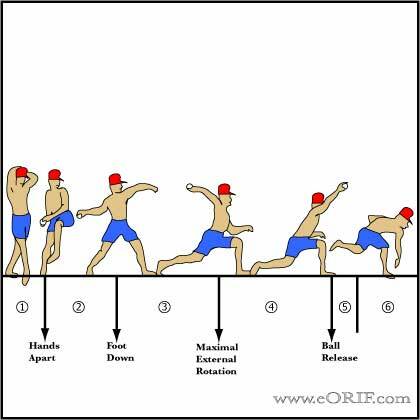 Phases of throwing: wind-up, early cocking, late cocking, acceleration, deceleration, follow-through (DiGiovane M, JSES 1992;1:15). Early and late cocking produce the highest valgus loads to the elbow; 120N-m in adults. Athletes should be screened for posteroinferior capsular contracture by measuring the GIRD. If the GIRD less than or equal to the external rotation gain, normal rotational glenohumeral kinematics will be maintained throughout the throwing cycle. When GIRD exceeds the external rotation gain (ERG) (GIRD:ERG ratio >1), the shoulder is at risk for SLAP lesions. (Burkhart SS, Arthroscopy 2003;19:641). Young pitchers should avoid throwing curveballs and sliders. Young pitchers should be limited to 75 pitches per game or 600 pitchers per season. (15 batters faced per game or 120 batters per season). DW Altchek and DM Dines Shoulder Injuries in the Throwing Athlete J. Am. Acad. Ortho. Surg., May 1995; 3: 159 - 165. Frank S. Chen, Andrew S. Rokito, and Frank W. Jobe Medial Elbow Problems in the Overhead-Throwing Athlete J. Am. Acad. Ortho. Surg., March/April 2001; 9: 99 - 113. CD Miller and FH Savoie, 3rd Valgus Extension Injuries of the Elbow in the Throwing Athlete J. Am. Acad. Ortho. Surg., Oct 1994; 2: 261 - 269.